Where first impressions are important to your business, you should consider installing a glass canopy to your premises. A commercial glass canopy can provide a welcoming reception for visitors to your offices and provides you with space to promote your company name and stand out from the flat face surface of the high-street. Unique Metal & Glass has an abundance of knowledge and skill when it comes to glass canopies, so if you’re looking for advice and guidance, look no further! How much coverage will the canopy provide? During the winter when the conditions are poor, it’s inevitable you’ll want your structural glass canopy to offer sufficient shelter for when the weather is bad. A glass canopy needs to prevent the sun’s rays from penetrating through the glass and causing a hindrance too. Sunlight will bounce off the structural glass canopy and be reflected. This will ultimately maintain a luxury finish to your building. Where will rainwater land from your canopy? A glass canopy has a smooth design that’s especially enhancing for any business. The canopy will ultimately provide shelter for the entrance of your business, allowing customers to keep dry and sheltered. If a canopy is sloped, rainwater will run off to the side- ensuring that the entrance remains dry. A poorly installed entrance canopy can leave your business’ entrance damp and possibly lead to customers and employees getting wet, so make sure that you choose a canopy design that suits the environment that your business is located in. What do you want to achieve by installing a glass canopy? 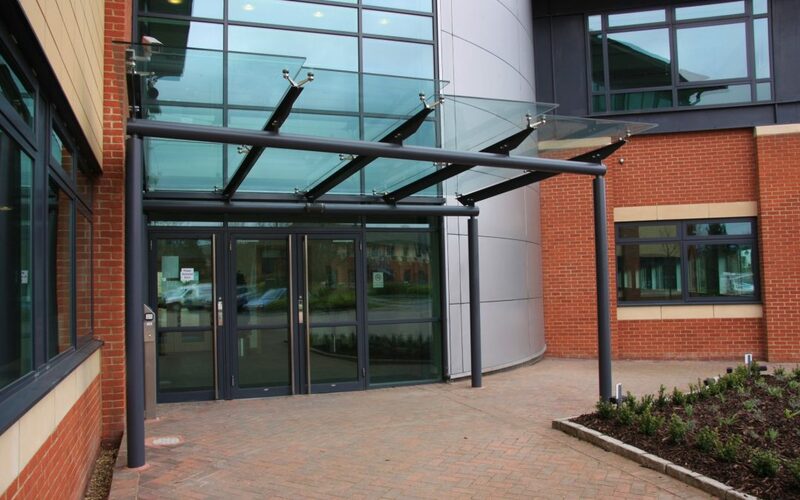 Our commercial entrance canopies are designed to suit your specific needs and wants. Additionally, commercial glass canopies are designed to offer protection against the adverse weather conditions be it heavy rain or those blazing summer days. Here at Unique Metal & Glass we supply an extensive range of glass entrance canopies that can be tailored to match the style and fell of your business, welcoming both your customers and staff. If you’re looking to create a classical feel to the entrance of your business, you could benefit from a transparent glass canopy, whereas if you want to choose something more minimalistic and modern, why not consider a frosted glass canopy? Unique Metal & Glass provide a complete range of products for you to choose from. We combine stylishness with functionality, to create the most creative finish to your building. When choosing a glass canopy for your building, you should consider all of the above and make sure that it fits in perfectly with the surroundings. We sustain a close working relationship with all our clients, ensuring that their premise looks fantastic! If you require any further advice or design ideas, choose UMG, we are always on hand to provide you with a bespoke solution. Call us on 01246 208 789 today!